Hope someone can help me out I just bought a new old stock motherboard because my old one died. It was a different brand motherboard. This motherboard has Realtek ALC1200. I tried the newest version and old versions of the drivers and nothing will let me assign the Audio jacks manually like my old motherboard would. I need 2 audio inputs. How can I change the grey output and make it an input? I don't know if your board is physical capable to use both jacks as line-in, chance are that one of em is not hardwired for that. Did you find the registery-keys I suggested in my other post? hey guys, unfortunately, what i tried doesn't seem to be working, i can't even get to the proper folder, so if any of you would be so kind t oexplan this dummy style to me, please do. first off, i would like to switch my audio and microphone jack around, since my audio jack just broke today. i am using a (dutch!!) 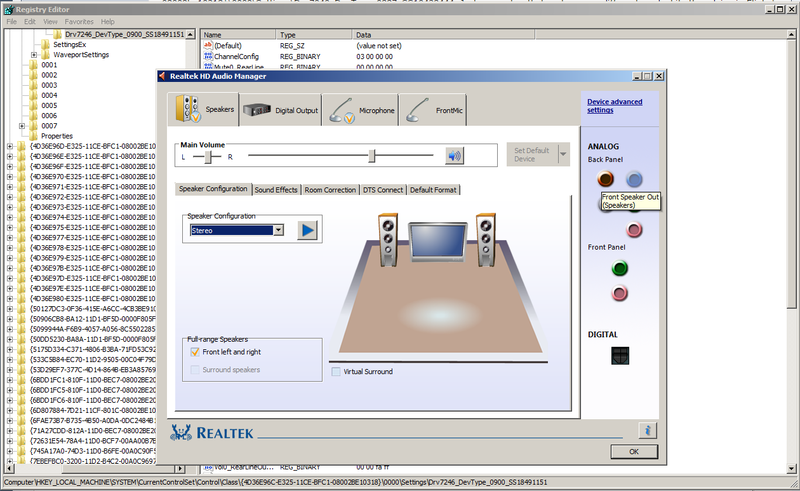 win 7 64 bit OS(i don't know wich tho) and my audio sollution is done by realtek. Was running from forum to forum trying to solve this. I have z97 mobo that I upgraded recently, old mobo allowed me to hotswap in windows. Followed various instructions, including those from reaper-x, all to no avail. Changing pins in the registry changed back upon restart. Also, in my registry only 4 pins were listed: Pin15, Pin18, Pin19, and Pin1a. 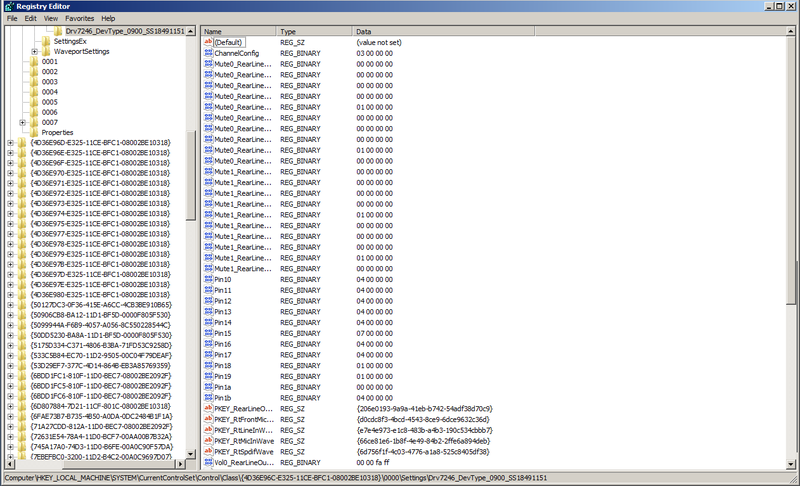 Any attempt to modify or delete those values was undone whenever I restarted. WHAT WORKED (for me): Brute force! Rather than trying to pick the RIGHT pin, I just took all non-listed pins and set them to binary value 04 00 00 00. When I rebooted, I opened up the realtek audio HD program and low-and-behold, my orange jack had become a front speaker! If you are so inclined, you could also go through and delete each pin you added to figure out exactly which one caused the switch, or add more pins in the "Pin00" through "Pin0F". Just adding in all the pins as 04 00 00 00 (front speaker) solved my problem so I'll leave it here. NOTE: If you are using a setup that already uses the orange jack, remapping this won't help you unless you don't mind losing the center/sub. This will only work if you are just trying to get two 'front speaker' outputs, without a more complex speaker setup. x-posting this to some other websites that I looked for assistance on. Whoever discovered this needs some big time credit!!! Does this only work if you have HD (etc) audio 'devices' (speakers and stuff) that you're connecting to? I've just bought an SPDIF cable and subsequently discovered my old sony minisystem is optical OUT, not in. any suggestions for aspiring music producer kit (Hardware)? Do I need an amp and a mixer and some cabs for live setup? REALTEK|using front speakers through rear output jack - possible?